Long, long before Batman there was already a wealthy man living a double life as a masked and caped vigilante, a superman in everything but the name, battling corrupt law enforcement as well as everyday criminals, with a select few loyal servants who know his identity and help him in his endeavours. That man is Zorro, alias Diego de la Vega. He sprung from the pen of Johnston McCulley in 1919 in the novel The curse of Capistrano. Since then, numerous other novel, short stories, movies, and television series were based on the character, one of the most famous being the 1957 live action series by Disney with Guy Williams playing the lead. The following scene occurs in the 11th episode of the series, wherein the nefarious captain Sánchez Monastario sets a trap, which de la Vega avoids with a fox’s cunning. Diego de la Vega himself is on the right, playing against someone who is addressed as señor alcalde from which I infer he must be the mayor. This episode first aired in 19571 which is perhaps why I haven’t been able to find a very clear picture of the position. Fortunately, it seems like the game is only just underway – or perhaps both players are extremely slow – and most pieces are still on their home squares. It is clear that white’s knights are already out, but his bishops are not. On the other hand, black has build up a d6-e5 centre and seems to have brought his knights to f6 and d7 respectively. which is a completely standard position from the Philidor opening,3 typically reached after 1. e4 e5 2. 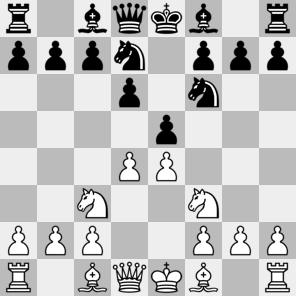 Nf3 d6 3. d4 Nd7 4. Nc3 Nf6. Here, the most natural and perhaps the best option is 5. Bc4, which leaves white in a good position. The wild 5. g4 and the more timid 5. g3 are also possible. However, Zorro goes for a far rarer option: 5. Bg5. And that’s where you come in. Yes, you, dear reader. As far as I can ascertain, this 5. Bg5 variation is perfectly playable but has no name. I propose that we dub it the Zorro-variation and try to make it an official thing. 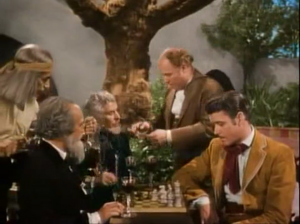 Chess openings tend to get their names form common use, so I urge you all to go out on the interwebs, play it, talk about it, spread the gospel of the Zorro opening! Realism: 5/5 This position has actually occurred many, many times. Even in my own games. I cannot possibly deduct points here. Probable winner: The position seems fairly level, with chances on both sides. Ideal for a new battleground in opening theory! Hail, all hail the Zorro-opening!